GoodReads Summary: Help hungry crows avoid a feline foe in this clever concept book from the author of The True Blue Scouts of Sugar Man Swamp and The Underneath. One, two, three, crows in a tree, bedecked in red scarves and hungry as can be. So they fly out of their nest with snacking in mind, and snack they do. Snack one, snack two, snack three;all the way to a dozen! But before they have time to complain about bellyaches, they have a bigger problem: a cat has been eyeing them;as potential snacks! Can these well-fed crows become well-FLED crows? Read and find out in this counting book from Newbery Finalist and two-time National Book Award Nominee Kathi Appelt, with spot-on illustrations from Rob Dunlavey. It's the cat's meow! What I Think: The other night, Peanut, Little Bean and I sat down to read three counting books and Counting Crows was one of them. We had fun counting as more and more crows joined the crew. It was even fun for Peanut who just finished second grade. We talked about counting by two and then counting by three. And towards the end, when there were twelve crows, we discussed the word "dozen" and what it means. As I was reading, I fell in love with the simply description in this book. 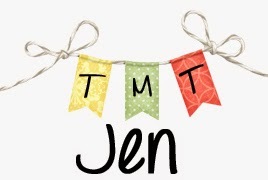 I'm a fan of description and the more I write, the more I realize just how important it is to show instead of tell. Sometimes even when I think I'm showing, I'm still telling. 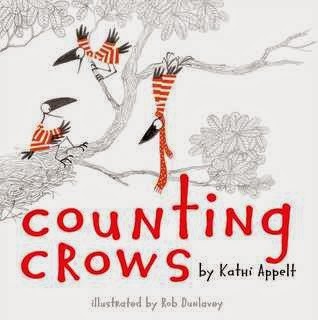 Having a mentor text like Counting Crows is great because it's easy to zone in on the rhyme, alliteration, and great adjectives Kathi uses and then to help students see how they might try being descriptive in a similar way in their own writing. Ten for the counting crows. Writing Prompts: Write about something in your life using some awesome adjectives and even trying some alliteration.